Martin, George R.R. 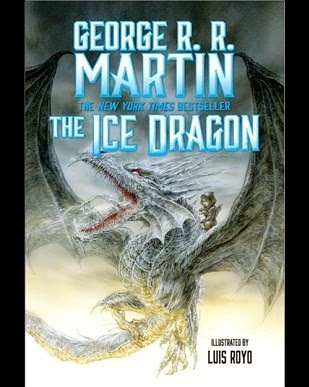 The Ice Dragon. Tor Books, 2014. Buy it here starting on Oct. 21st. This is one of those good news, bad news kind of situations. First, the good news: this packs a surprising wallop, emotionally speaking. Adara, a young girl, seems to have a very special relationship with winter--and, we soon learn, with the eponymous Ice Dragon. It is what sets her apart, and Martin reveals, in his skillfully understated way, that this yawning distance between her and her family cuts her deeper than any icy blast of winter. But ice must one day melt, and Adara chooses to risk her unique nature in an act of love for her family, despite the hurt their coldness has caused. It is a question well worth asking: would you give up what makes you unique, to save people who don't fully appreciate you? All in all, The Ice Dragon is a well-written, thoughtful, unexpectedly moving story of a young girl coming to terms with her own identity. What more could one ask for? In a word: more! This, dear reader, is the bad news: it's really short! How I wish this lovely tale would continue longer, and take us deeper into Adara's adventures! (The chance of a 'sequel' to Adara's story as told here is virtually nil, due to developments near the end.) Of course, this is an illustrated novella, or in truth a short story, with a very young target audience, essentially late elementary school (another mark in its favor--despite being written for ten-year olds, this story captivated somewhat-older-than-ten me too), so I have no right to demand a Song of Ice and Fire-style multi-volume epic, I suppose, and yet that's exactly what I want to demand. The gauntlet has been thrown, Martin--now let's see if you can find a write-around and rescue Adara from the harrowing fate of being sequel-less! Happy Columbus Day, by the way--never has there been a sillier holiday, in which we are meant to celebrate the breathtakingly Eurocentric notion of 'discovering' a new continent (comically mistaken as India, let us not forget) despite the facts that 1) Columbus wasn't even the first European to 'discover' the Americas, 2) he never landed on the continent, only on nearby islands, and 3) I'm still having trouble with the "there were lots of people living there already" angle! I think this should be renamed Irony Day, and we should celebrate it by going out to buy Indian-American food. Put *that* chicken tikka masala in your pipe and smoke it, Chris! Penalties: -1 for being short, and -1 for seriously, it's really short! Nerd coefficient: 7/10 "An enjoyable experience--in the way that riding a nine-second roller coaster would be fun (as well as frustratingly short)"
Zhaoyun, NOAF stalwart since 2013, is reputed to like all manner of sf/f stories, but especially those that managed to sustain the thrill of a nine-second roller coaster yet offer the duration of a Noh play (and for those of you who don't know--that means looooooong).